It's a been a fairly good week thus far with a package of charity models arriving safely in the UK at the project's organizer, while my ISP has seen fit to allow me a stable enough connection to actually be able to upload pictures to my blog (or do my actual job for that matter). 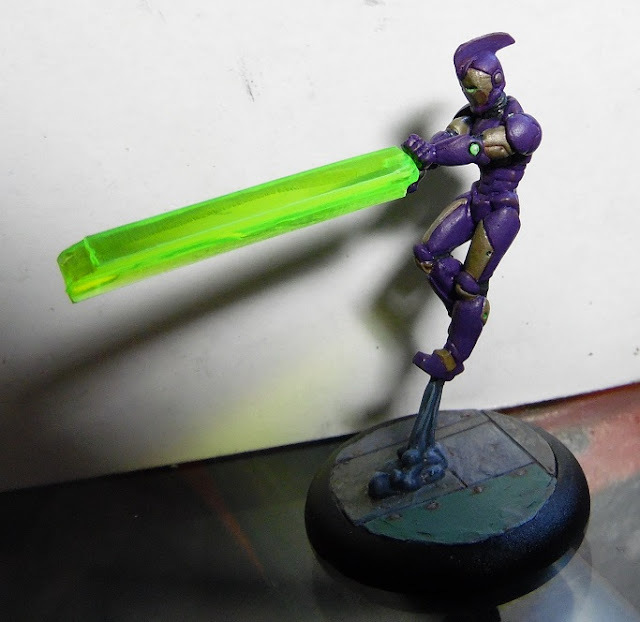 So first up is that overdue 'what are those models actually'-post! 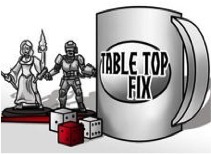 I help out over on the Tales of a Tabletop Skirmisher Facebook-page (link), where I get to share all sort of news, minis and give away the odd model every now and then to a community of fellow hobbyists that love smaller, warband-scaled games. So when head honcho Hendybadger (who's also on blogspot here) wanted to set up a charity event to help support the Downs Syndrome Association I knew I had some digging for goodies and suitable models to do. 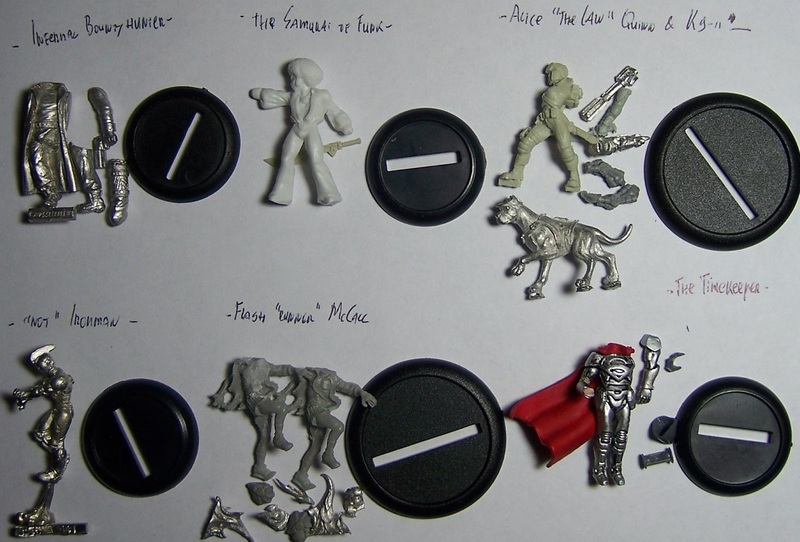 What better way to help support a miniature project for Little Heroes, with some extra little heroes. Several candidates didn't make the cut or their conversion just didn't quite work out as hoped, though some of them may get another attempt in the future. There's some potential there I think, but lets move on to the models that did make the cut. I've had the Reaper Afterburn model (link), sculpted by To Mason, for years without having a use for it. While looking for suitable models he instantly jumped out as being both a fun and interesting model to work on. I was initially tempted to sculpt some flames shooting from his arms and go with an actual Ironman colorscheme, which suits the model perfectly. 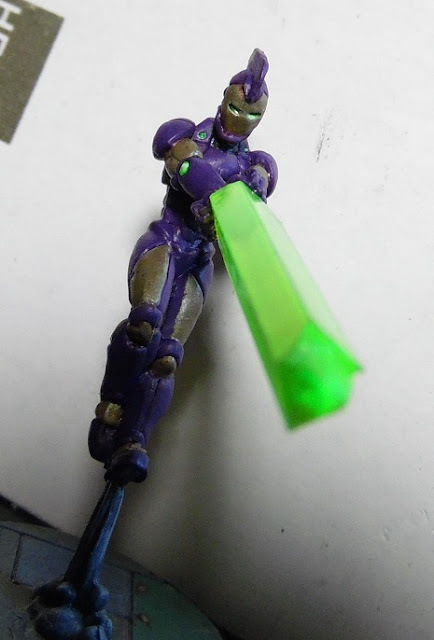 However, I was at the time also putting together some Counterblast scifi pulp models and used some green, clear plastic crystals cut from old GW Necron weapon sprues. There just happened to be a left over piece of sprue that fit perfectly between the model's hands. For me, that instantly settled the rest of the model's look. Painting wise two main things went into the model, first making the purple rich and contrastful. Something that in and of itself is simple enough, but to really make the model pop I added some orange extreme highlights. 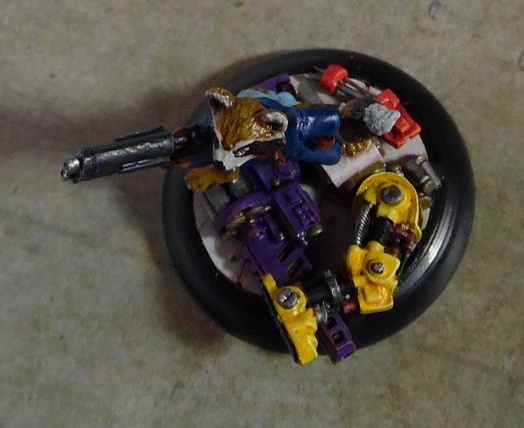 Tough to see on these pictures, but check further below for a better example on Rocket's big gun. Secondly was to make certain the gold was smooth and shiny. Being used to the rather thick GW gold paints I've recently stepped away from using any gold paints directly on models, they're generally just too thick to lead to nice smooth results when using multiple layers. It's much more effective to mix another color into a silver paint, these generally have ton of pigment and have very smooth variants in all sorts of different paint ranges. In this case I was using old GW Boltgun Metal mixed with Vallejo Game Scrofulous Brown to get a very smooth base gold paint to work with. For other colors you could use check out the DakkaDakka Paint Compatibility Chart (link), very helpful reference in general. Next up we have HassleFree Miniatures' Harby (link), sculpted by Kev White, who already comes with an extra head and both a 'glove' and normal fist arm. 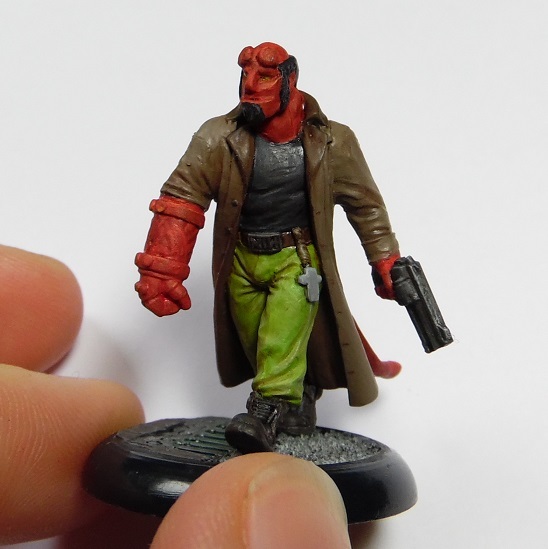 The base bits will give you a great Sin City Marv, but I just knew I had to resculpt the head and add a tail to go with good, old Hellboy. Naturally with a ton of Ron Perlman influences! 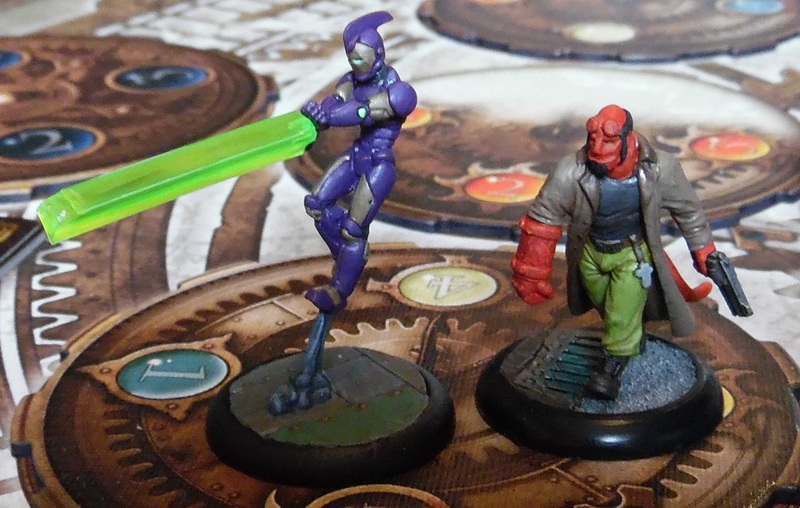 Produced by Greebo Games (link), these nifty models started out as promos in their Indiegogo fantasy race football campaigns. Luckily these, as well as a set of cute versions and a whole range of villains, are now available to everybody! I'd initially picked these to both support Greebo and to have something cool for a future giveaway, so they're perfect for a charity project. Definitely need to pick up another set some day for my own collection, very characterful models! 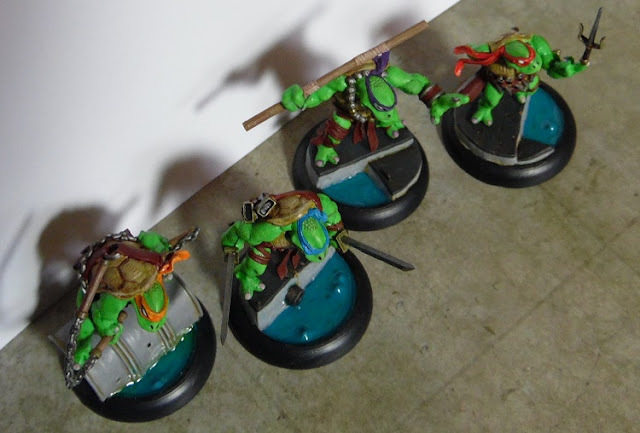 Also made some custom bases with water effects for the lot, figured I'd go the extra mile to give the models that little bit of extra height and tabletop presence. 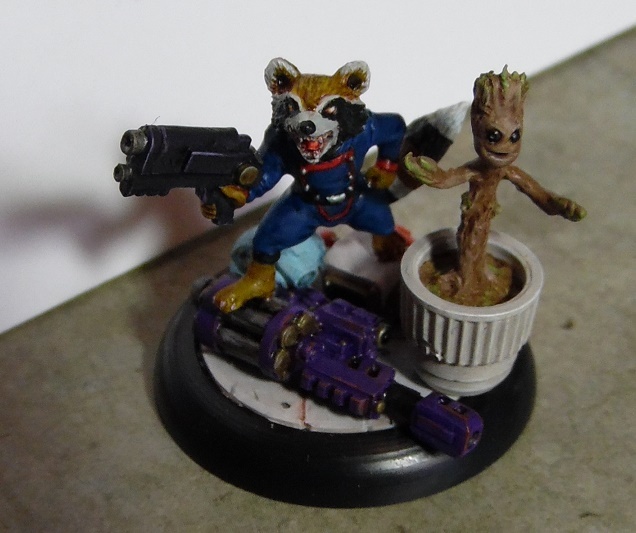 And finally there's Rocket Raccoon, who started out as a bit of a brainfart hobby project that turned out quite nicely. 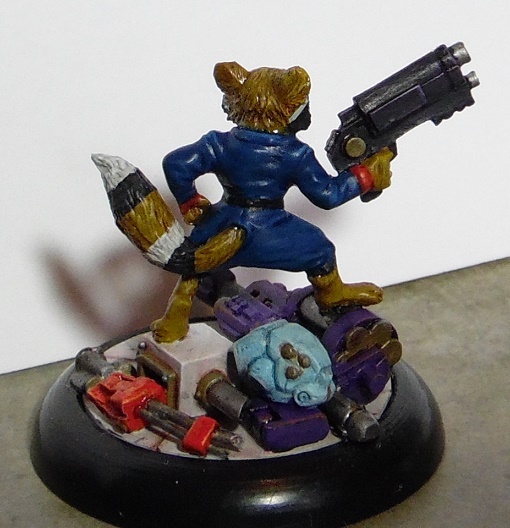 Picked up Bombshell Miniatures' Combat Wombat model (link), sculpted by Patrick Keith, for use in their Counterblast scifi pulp game (have an old Look at-article up for the entire range here). However with their latest expansion Kickstarter I'll be ending up with an extra copy. So this guy, using old school colors, would be great for the project. The downside is that the model is quite short, so I figured some extra base work would be in order to give the character' attitude some more physical presence on the tabletop. So he ended up standing on top of a pile of captured goodies, mostly weapons of course. There's a few 40K leftover bits and bobs in there, while the helmet is from PuppetsWar extensive range of resin heads (well worth a look!) and the rifle is a leftover from Anvil Industry's Afterlife range (link). That does however leave a nice, open spot on the right side of the base, underneath which a little magnet is located. 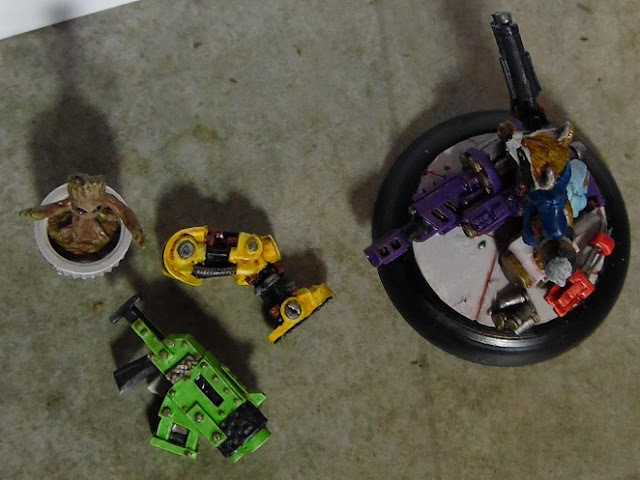 So whomever ends up with this mini can choose to add one of the three magnetized accessories to the base or even something of their own making. 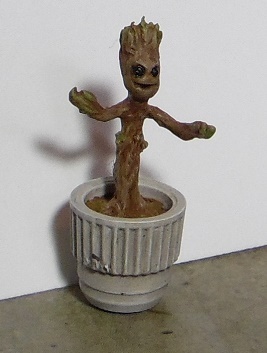 But I think the last option is the coolest, a sculpted baby Groot. The model was just begging for this addition and this little sculpting experiment turned out quite nicely. 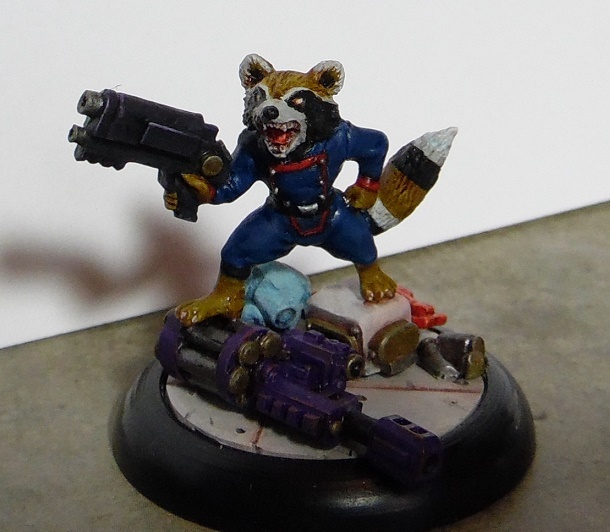 Raccoon was definitely my favorite mini of the entire lot, had a lot of fun figuring out all the little details and tackling a, for me out of the ordinary, bright color scheme. 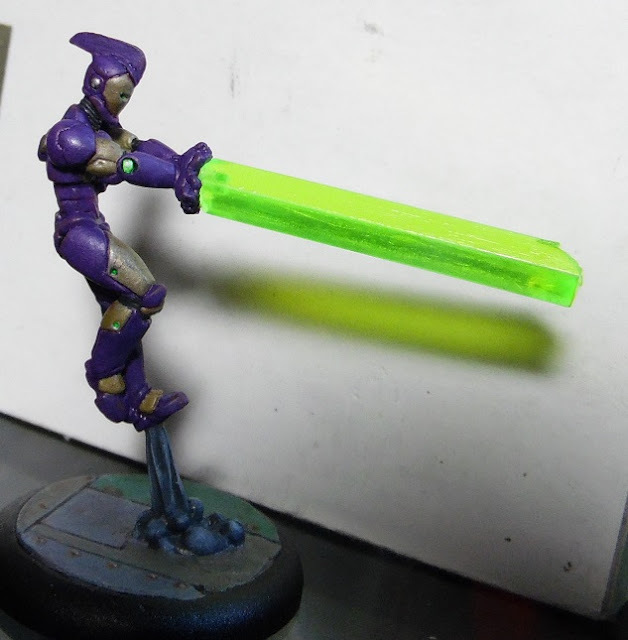 All in all a good bit of fun an hobby challenge that will hopefully help raise a few extra bucks for charity, while given some unused superhero minis new loving homes in the process. Everybody wins! I'll do another update once all the entered models will go up for auctions and for anybody interested in joining in there's still time till November the 27th to get models sent into Hendybadger to help out the charity and maybe even win a few goodies in the process (for info see his blog - here). 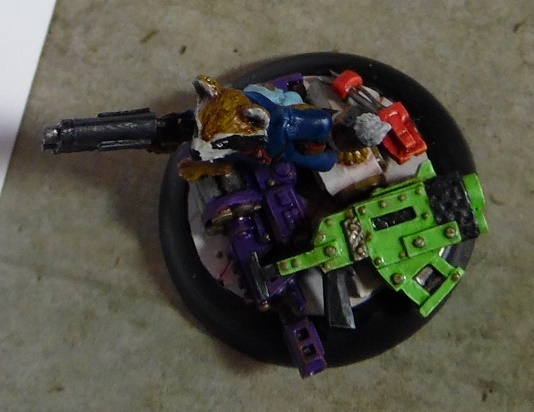 The bases you made for the Tartalar are amazing, but the raccoon's base is a bit too crowded for me. 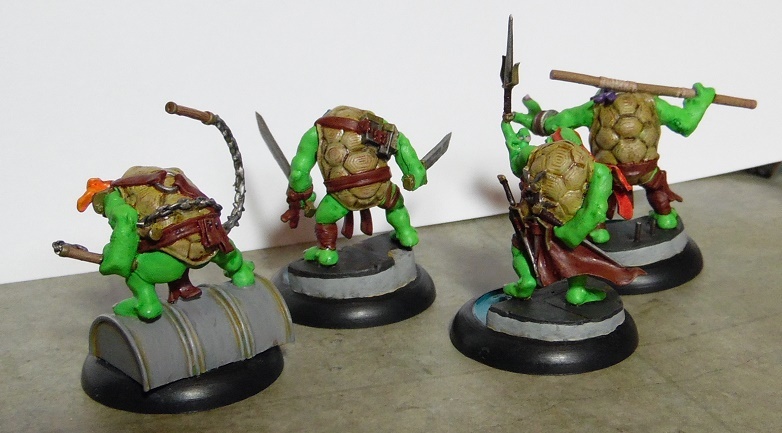 I had planned to paint up some of the bad guys from the Greebo turtle team Indiegogo campaign for the Charity project you mentioned. Your post sure has gotten me warmed up to start assembling them ;-). 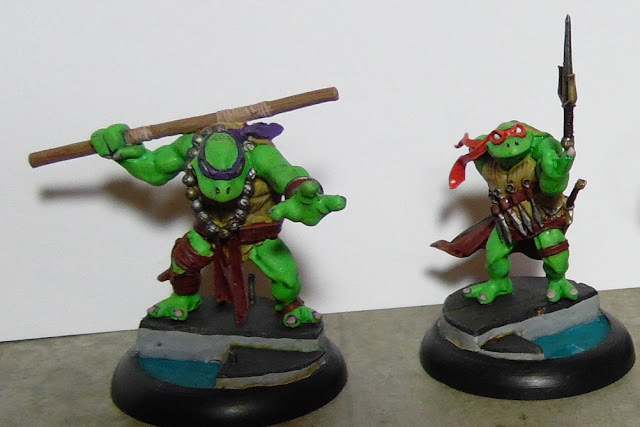 Thanks, the turtles needed a bit of extra height given their poses and the sewer theme was just perfect. 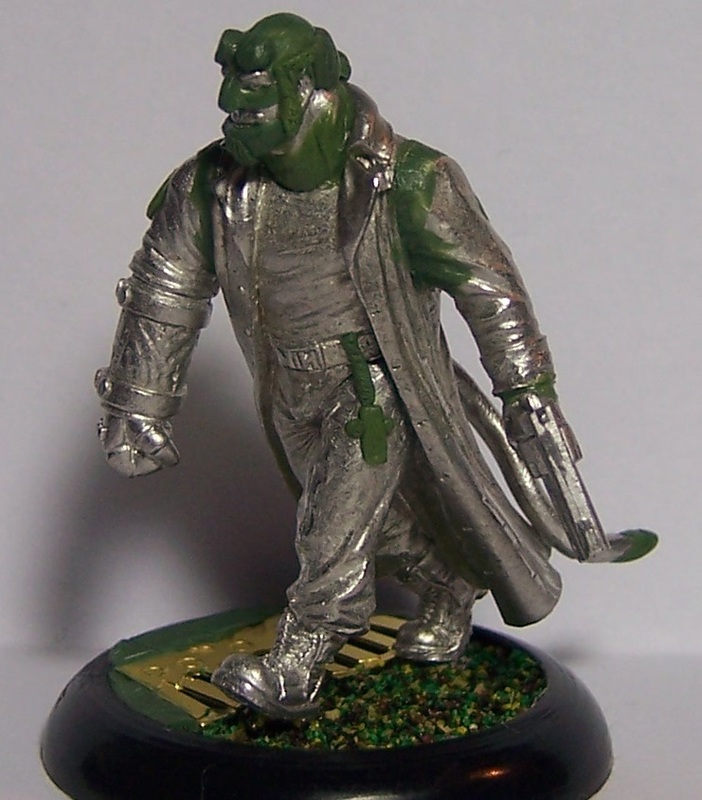 Hope to eventually do a few more for the villains I have around, Greebo certainly did a great job on those sculpts. Great to hear they may end up with some adversaries soon, have fun with those villains!